WHY COLLABORATE WITH NANNY MAGAZINE? Nanny Magazine is the premier magazine in the United States published just for nannies. Tap into a diverse audience with phenomenal purchasing power. Categories of interest run the gamut from health and wellness, to toys and learning, to beauty and fashion. Put your brand in front of thousands of informed nannies in the know. Nanny Magazine answers nannies' most common questions about how to best do their jobs. Real nannies who care about their field want a magazine just for them. Parenting and family magazines don't adequately cover the subjects nannies want to read about the most, such as tax issues, ethical dilemmas that are specific to nannying, falling in love with someone else's child, and how to quit with grace when it's time to move on. Nannies want to read real-life advice and research that is specific to their chosen career path; that's something a parenting magazine won't provide. TO VIEW OUR MARKETPLACE, PLEASE VISIT WWW.NANNYMAG.COM/MARKETPLACE. ALL ADVERTISEMENTS WILL RECEIVE A COMPLIMENTARY ONE-YEAR MARKETPLACE LISTING ($55 VALUE). Since the start, Nanny Magazine has published authors with a diversity of expertise. For 2017 and beyond, we are scheduled to publish articles on hot topics like guns in the workplace, obesity, and autism. Our roster of authors includes professional freelance writers, PhDs, veteran nannies with years of experience working with children, agency staffers, well-followed real-life moms from the blogosphere, and subject-matter experts in autism and pediatrics. We've got all the bases covered. Nanny Magazine's contributors have fantastic #NannyLife stories to tell. We're resilient, we're growing, we're teaching. Just like our audience. Although parenting and family magazines are often read by nannies, the only accessible resources that are just for American nannies are blogs, newsletters, forums, and each other. When Nanny Magazine launched its Facebook and Twitter presence on March 13th, 2013, the demand for an official magazine publication with nannies in mind was echoed loud and clear; we had 1250 likes on our Facebook page and 380 followers on Twitter by our sixth month. Today, our audience reaches ten thousand nannies and their employers. Nannies across the country want this magazine. For data about nannies in the United States and the nannying profession, click here. 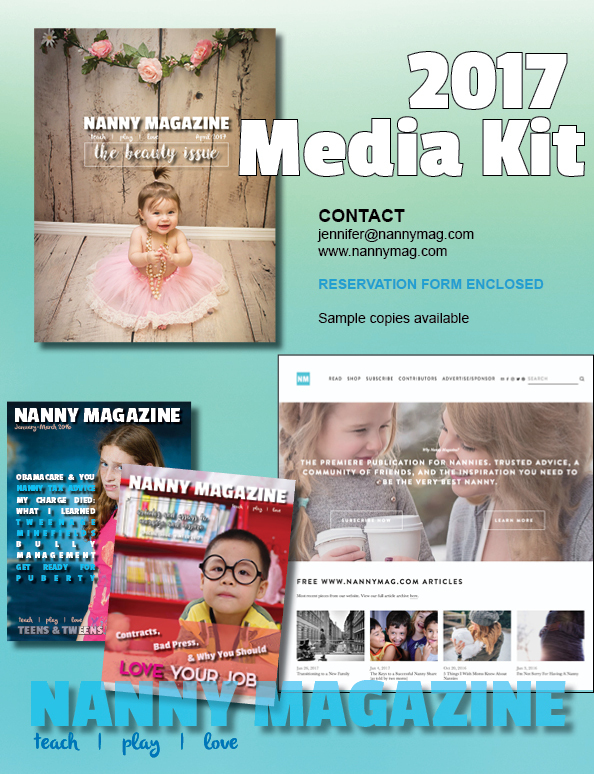 TO ADVERTISE IN NANNY MAGAZINE OR NANNYMAG.COM, or to obtain a copy of our media kit and editorial calendar, PLEASE EMAIL INFO@NANNYMAG.COM.